Hey Everyone! Welcome back to SEPIA SCENES. I'm finding so many have their Sepia Scenes post up already so I'm posting mine now (1:11 PM EST on Wednesday) also. Today I offer you a Tudor house in HALF SEPIA. This lovely house won the Queensmark, an award given by the Queens Historical Society. The award was created to honor those structures and sites in Queens communities that deserve special recognition because of outstanding architectural, cultural, or historical significance. If you look very closely you can see the Queensmark to the right of the door as you look at the photo. The name Tudor suggests that these houses were built in the 1500s, during the Tudor Dynasty in England. But of course, Tudor houses in the United States are modern-day re-inventions and are more accurately called Tudor Revival or Medieval Revival. Some Tudor Revival houses mimic humble Medieval cottages - They may even include a false thatched roof. Other Tudor Revival homes suggest Medieval palaces. They may have overlapping gables, parapets, and beautifully patterned brick or stonework. These historic details combine with Victorian or Craftsman flourishes. I hope you'll sign Mr. Linky and leave a comment. 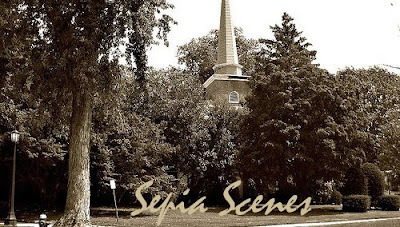 Don't forget to visit your fellow participants in Sepia Scenes. Great house, Mary. Love the cobblestone and brick adornments. It is a lovely looking house. I do like all the stonework. Does someone live there? I have always loved Tudor-style homes. Today I went with two different pictures of the same word: "guineas"
Check out It's A Blog Eat Blog World when you get a chance! We have a lot of Tudor style houses around here given that we're the home of The Lost Colony and all. You know, Elizabeth the One and all those guys. Actually I don't know if that's the reason or not, but it's popular around these parts. Nice processing on this. Not too "caramel" which is usually my problem. And last I can remember SS was going to start going live at 6:00 am for those in the Eastern half of the world... I just try to spread mine out a little so there's not an allasudden deluge of meme posts coming out of Mojoland. 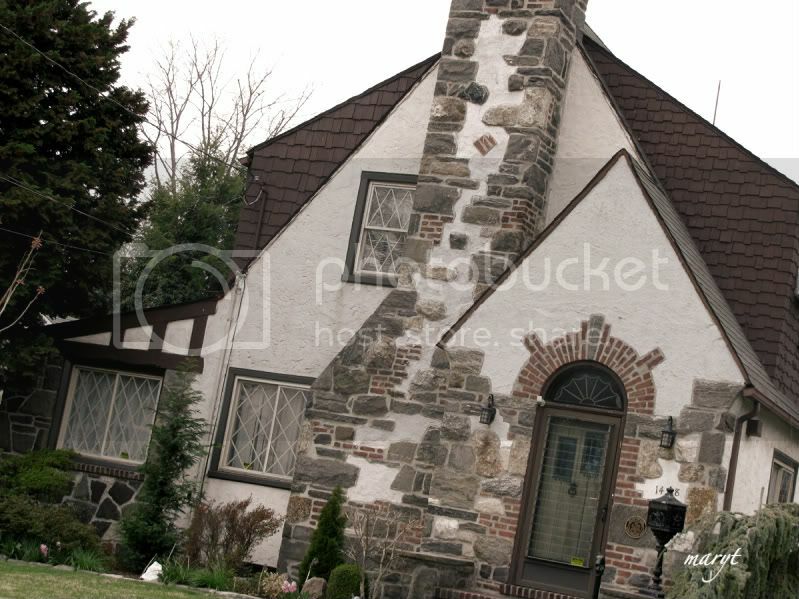 That's what I noticed when I was in Queens last week, the houses/neighborhood was amazing. That is a lovely house, and I love the half-sepia effect! Vey cool looking house. I really like the arch over the door and the chimney. Fascinating detail! Love buidlings like this which add an extra touch of creative artistry! I'll be back later when Mr Linky appears! Mr. Linky is AWOL - I don't know if I'll be able to come back later, so my post is here. I love the effect on this house. I'd love to get a closer look in person. I remember even when I was little the amount of Tudor styling all over Bayside. Apartments, detached houses and retail along Northern Boulevard. You live in a fine neighborhood filled with classic architectural style and details. Nice! I love stone houses and the half sepia, half colour is a very nice effect. Hi, it's my first time to join here. I'm glad Ewok gave me the idea for my post today. Thanks to the host, mary. The Tudor is lovely. I wish that I could live there! I love half sepia, Mary! Alas, I haven't figured out PSE7 yet. I even followed EG's line by line instructions, but due to what I think was a version difference, I tripped up! I hope to take a few photography classes at the college this year. This is a wonderful looking home. I love. it.